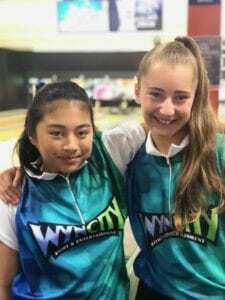 WYNCITY Point Cook's largest Tenpin Bowling & family entertainment centre proudly offering World Class facilities to be enjoyed by customers or all ages and abilities. We would love for you to be a part of our state of the art bowling & entertainment centre. Now recognised as one of the best in the Southern Hemisphere. We will provide you with all the basic equipment to get you started. A 3 game format takes approx 2 hours to play. Juniors bowl 2 games and run for no longer than 1 hour duration. The bowling handicap system is designed to help even out the playing feild, allowing all level of skill and ability to compete in a fair play competition. Your weekly payment comprises of bowling fees and a prizefund. This fund is collected weekly and dispersed at the end of the season. Depending on the comp, you may win cash, prizes or trophies. All league bowlers are required to become a member of Tenpin Bowling Australia (TBA), the governing body of this sport in Australia. Your membership has many benefits and rewards, depending on the level you choose. All memberships include sports insurance to cover you in the case of injury. Your level of membership will determine your rewards such as; FREE GAMES, discounts in our Wyncity Restaurant and cafe, just to mention a few. Win cash, prizes or trophies! 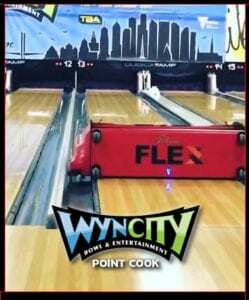 WYNCITY is one of the only centres in Australia with a Flex Lane Machine from Kegel allowing our expert lane technicians to apply competition grade, durable and consistent patterns for your bowling enjoyment. We also have a number of other advanced training aids that are available to our members on select dates. Looking for your latest results? Visit our League Bowling scores page by clicking below. Bumper League suited to ages up to 12 years. Junior League suited to ages up to 18 years. Subject to change. Please call the centre if you have any queries.